Anyone who has ever experienced Athletes Foot knows it is annoying and itchy. Athletes Foot can also get stinky. But preventative measures are much better than treatment. So cheap solution drop a few drops of tea tree oil in a small jar of Vaseline (10 was my magic number). Now I don’t have athletes foot but made it for a friend that swears by it. I actually used this after having surgery to moisturize my skin with minimal additives. I have continued to use it to avoid dry cracking skin. I am sure the Vaseline could be subbed with coconut oil for an even better moisturizer. I love saving money. I especially love diy projects that save me money. I hate feeling like something is going to waste (but I am not a hoarder). So I have a fruit bowl on my table and every week I add a new fruit. This week it was grapefruit (trying to speed up the metabolism). I decided I wanted to find a way to use the leftover rinds, and I got a bright idea to make a scrub. So I will grate the rinds and add sugar, honey, and coconut oil for a great bathtime exfoliater that I am sure will smell delicious. I will have a follow up post after I play with the recipe. Recently I attended a function at this spot called Flourish in Baltimore MD. The name of the meeting was A Goddess Deserves a Temple. It was so deep and so in tuned with the universe. In the meeting we discussed having a home where your energy could be positive. Where there wouldn’t be chaos or negativity. Now I pray and I read my bible and some Christians had me scared to explore Chakras and read things about Astrology. However, after going to that meeting and going to a follow up meeting called The Astrology of Loving I felt new. It was like that third eye opened. I had to meditate on this during my prayer session with God and it was like I had a Eureka moment. Why wouldn’t God want me to be curious of the stars and the moon and the soon and how they all affect my life. God created these beautiful things for me to enjoy and embrace. I started to think about how sometimes we get so caught up in the religion and we lose the relationship. The relationship is the most important part of knowing God and His word. I sat down today and finished reading the information about eh zodiac for my birthdate and my zodiac sign and I have to admit it was right on point. Me to the T and it was even kind of scary that someone would know me just from my birthdate. I have felt so in tuned with me since the meetings, it is like I am more in loved with me. I can’t wait to share this new found joy with my loved one. Check her out, she also has some great tutorials on her Youtube channel. Godspeed. I work a lot with my hands so I like to see them pretty. Usually I like to keep acrylic or gel tips on because my nails grow so pretty and long. However, both are very unhealthy for my nails and leave them in their natural state weak, brittle, and peeling. Also I find that this method of maintaing my nails is very expensive. 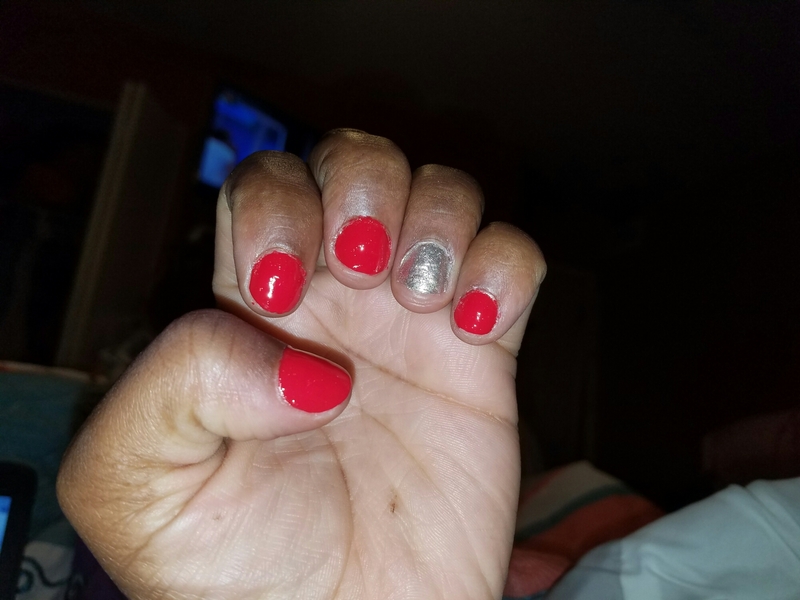 I am a nail biter as well so its hard to keep my fingers out of my mouth to give my nails a chance to grow. I have decided that I want to grow my natural nails out and give up on the tips, acrylic, and gel. 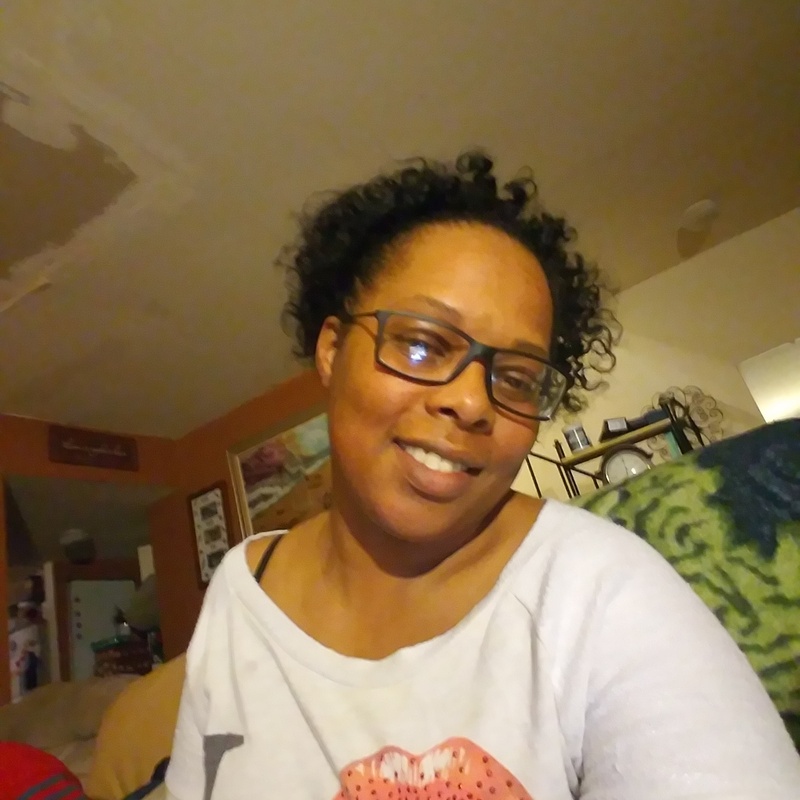 I have come across a few great products to help me reach my goal. 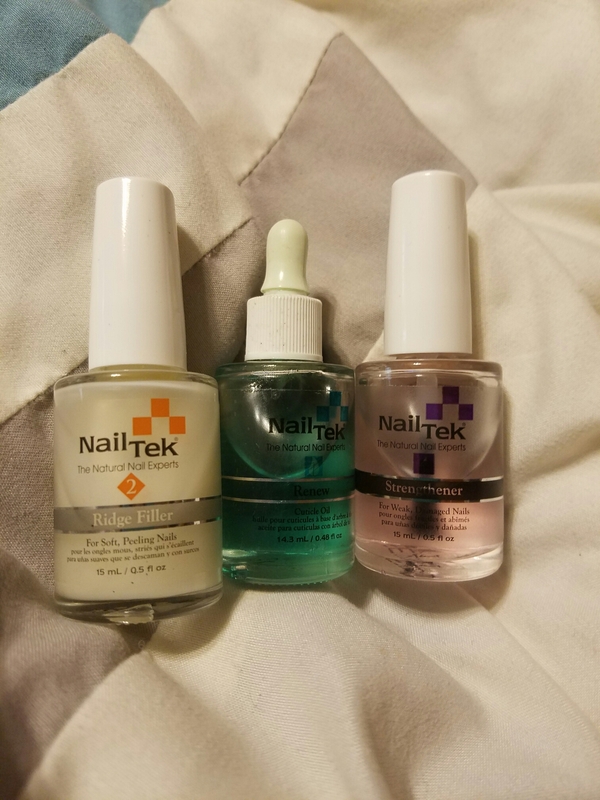 One product is the Nail Tek line. I got a kit from Sally’s beauty supply store and after two weeks my nails already feel much healthier. The base coat/filler also aids in keeping the polish on my natural nails much longer. The kit costs around $14.00 which is less than a fill on my fake nails. Now my second product of choice I also picked up at Sally’s for about $3 and is only necessary if you are a nail biter. It is called “Bite No More”, this stuff tastes horrible and reminds me to keep my fingers out of my mouth. I tried putting it on the very top but it was transferring to finger foods when I eat so now I put it under my top coat. This way I only taste it if I bite (and I avoid that at all costs). Last but not least I love my “Out The Door” top coat. It helps speed up the drying process and keeps my manicure looking fresh. On a side note I use to buy the cheaper polish (only when it went on sale for 99 cents). However, I have to admit that after polishing with OPI I am a fan. I picked up some discounted OPI polish at Gabes for $3.99 and it was love at first brush. It went on evenly and paired with the Nail Tek it gave my short nails a nice, neat, and professional look. Of course less is more because OPI is rather pricey I won’t be able to buy as much but I think it is well worth the budget. They aren’t where I want them yet, but like me they are a work in progress. I hope this article is helpful to someone else on a go natural nail kick. GODSPEED. Ok I wanted to experiment with the turmeric and mixing it with different items to make my mask. I have to say I love, love, love the changes it has made, in a short time, in my complexion. Initially I made a mix that would not require refrigeration (honey, lemon juice, turmeric, and a few drops of tea tree oil). This scrub was ok, but my next mask proved to be the truth (turmeric and yogurt). I love the results from using those 2 simple ingredients. Now I am considering combining the two (leaving out the tea tree oil). Most websites I researched also suggested using chickpea flour with the turmeric as well. I haven’t picked any up yet but I plan on adding that as well. I don’t use any specific measurements but I add the turmeric to my yogurt (I use greek) until it has a sandy/gritty texture. I let the mixture stay on a minimum of 30 minutes (most of the time longer). My results were amazing.